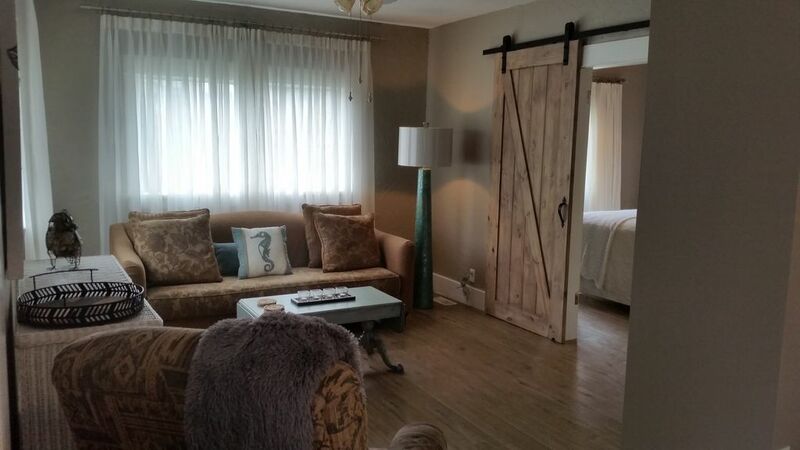 Our charming little guest house is located in the beautiful heritage district of Kelowna. (Abbott Street corridor) It is steps to Okanagan Lake and Kelowna City Park. A short walk along the scenic boardwalk will take you to vibrant downtown Kelowna where you will find coffee shops, restaurants, pubs, shopping, water sports rentals and access to many other activities and entertainment. After your day of activities you can relax on your own private patio that backs onto Mill Creek. We are also a 10 min walk to Kelowna General Hospital. Because of its central location, it is an easy drive by car to many Wineries, Golf courses, biking & hiking trails etc. This house is all about the comfort and location. We offer free wifi and parking. Access to yard and BBQ. Small pets will be considered. We live next door in the main house & have a small dog named Rosie and a cat named Pepper. Smoking permitted outside only. Our property is the second house in from the beach It is steps to the lake! need to provide your own beach towels. Dishes, pot, pans, cutlery, toaster, microwave, coffee press, utensils. What a beautiful place! It's evident that a lot of thought and time has been put into making this cozy cottage a comfortable place to stay. Love the decor, comfortable beds, and patio. The location is amazing as well; we did a lot of walking and loved having the lake and city centre so close by. Also enjoyed the BC wine and golf! Would highly recommend this accommodation. Thank you, Terry and Dale! We enjoyed have you as our guests. Terry and Dale - you have a wonderful property, and we are so happy to have been able to spend the week there. This is a charming guest house with everything needed for time away from home. Everything was spotless and well maintained, and you can’t beat the location - it’s a short walk to City Park and downtown Kelowna, along with easy access to the many different wineries of south Kelowna. For anyone with children - our 3 year old was delighted to stay here! We were welcomed by a friendly dog and cat, both of which were very happy to receive a “pet” from our son at every opportunity. Thank you both so much! We look forward to coming back! Wonderful location for a pretty, extensively outfitted house on the creek. Welcoming and comfortable for a long stay or a quick trip. My family of four stayed for the weekend. There was plenty of space, the home was very clean, and the kitchen was well stocked. It was decorated beautifully and felt very cozy - definitely a comfortable home away from home! We loved the location, within steps to the beach and close to great restaurants. The hosts were fantastic and always available to answer our questions. We would absolutely recommend this property to anyone looking for a Kelowna getaway.